The various dialects have expressions for 'how do you do?' associated with them. What state (are you in)? May the same befall you. Guests who are in a hurry and often unwilling to take a seat are often told. It's sae cheap sittin as staundin. In Pubs or other places where people gather a common invitation to join in is. Come intil the body o the kirk. Newlyweds are often greeted with. Refers to the custom of 'fit washin', washing the feet of the bride or bridegroom the night before the wedding. At the new year or when moving into a new house. Lang mey yer lum reek. Mey the best ye hae iver seen be the warst ye'll iver see. Mey the moose ne'er lea' yer girnal wi the tear drap in its ee. 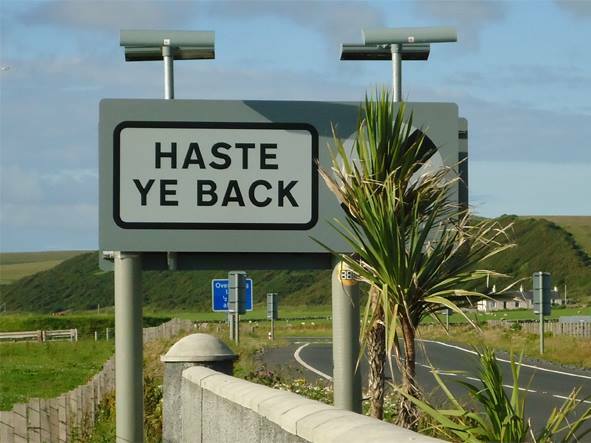 Mey ye aye keep hale an herty till ye're auld eneuch tae dee. May you always stay whole and hearty until you are old enough to die. Mey ye aye juist be sae happy as A wiss ye aye tae be. May you still be as happy as I wish you always to be. When writing letters the usual form of address is Ma freend, Ma fere or Guid billie corresponding to Standard English Dear. Formal letters begin with Guid Sir, Guid Mr. (Maister) or Mem (Madam) corresponding to Standard English Dear.